The machine is designed for bending of concrete reinforcement iron, for construction, in production of concrete armature. The machine bends all the profiles of diameters up to ø 22 mm. It can work as an independent aggregate, as well as an integral part of the mechanized technological lines for concrete armature production. The machine is constructed as a compact assembly, consisted of two functionally separated parts: working table (1) and machine stand (2). Bending tools and equipment are placed on the working table, and in the stand are placed drive mechanism (3), electro box (4) and programmer (5). 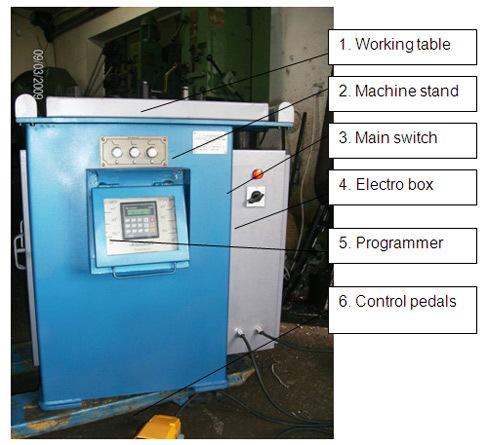 Separate elements of the machine are the foot tasters (6), which are movable and connected to the electro box by cables. The machine belongs to the new generation of machinery from this type. It enables electronically banding angles regulation, with the numerical input of requested data values. It has bidirectional operation, so it can bend all shapes of projected armatures. Also, its efficiency is enough to achieve the requested capacity. This kind of machine has to be able to bend at all angles, even if the most often requested angles are 45º, 90º and 180º. From those reasons, mentioned angles are entered into the program of both operating directions, for independent bending. 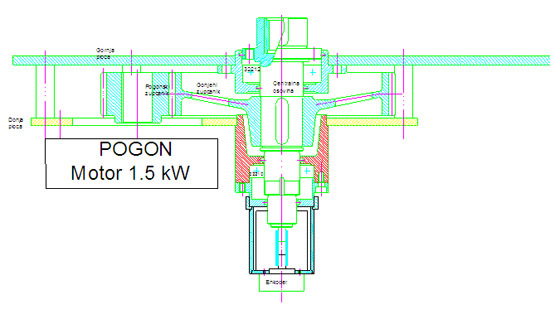 Programmed angles, three in each of both bending directions, can be selected by ← tasters. Bending direction, left or right, is selected by foot tasters, which are also the executive command for bending. Bending angles are entered in degrees, with the accuracy of ±1˚. 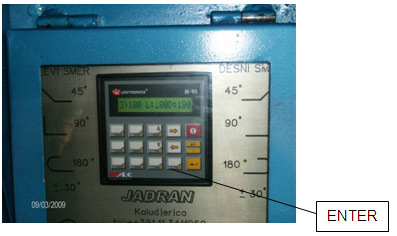 Measurement device, with the encoder of very high accuracy, is connected to the machine central axle. The machine is equipped with the set of pins and bushings, which combination always enables selection of the requested clearance, for bending armature of any diameter. The tool with the serrated pedal is used for bending of thin armature. Holes that are bored in the rotational plate are used for placing the pin with the bushing over it (depending on armature thickness). They enable the bending around the central pin. The machine is propelled by the 1.5 kW motor. Motor function is regulated by the frequency power regulator, which improves the quality and the reliability of the machine operation. Press the foot pedal to bring the rotational plate in the desired starting position. This position is memorized as „zero“. The angle can be selected by one of three buttons above the display. Given angles are 45, 90 and 180 degrees. Angle correction is needed if we do not get the desired angle. Correct the angle separately for the left and for the right pedal. Special tool (clutch) that is mounted on the central plate is used for bending of thin armature. 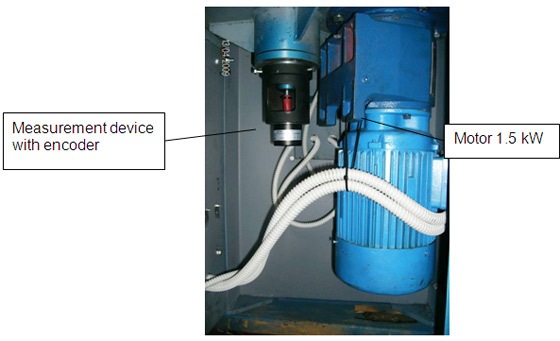 The clutch is fitted on serrated tablet in the turning head. The clearance between the central pin and the buffer is adjusted by sliding the buffer with the skater. This tool is used only for bending of thin armature (less than 16 mm). Central pin with smaller diameter is used. Bending of higher diameters armatures (over 16 mm) is presented at the following pictures. Pins and bushings are chosen according to the armature profile. Bring the buffer in horizontal position, i.e. parallel to the armature direction. Move the other buffer aside. Select the angle and the speed of bending and press the foot command to start the bending operation. If we are not satisfied with the bending angle, correct it. Starting position for bending is presented at the first picture. Armature is bended around the central pin. Put the adequate bushing on the pin, depending on the armature thickness and desired bending radius. After selection of the bending angle, as described above, use the foot command to start the bending. Bending is performed by turning the central plate. Bending of concrete steel causes production of large amount of metal filings and dust that harms all the mechanisms on the machine. Concerning this, detailed daily cleaning of the machine is necessary. This cleaning may be manual, by brushes and clothes, but the best is cleaning with the industrial vacuum cleaner. Wearing parts include all the bending tools. Machine operator alone replaces the wearing parts. 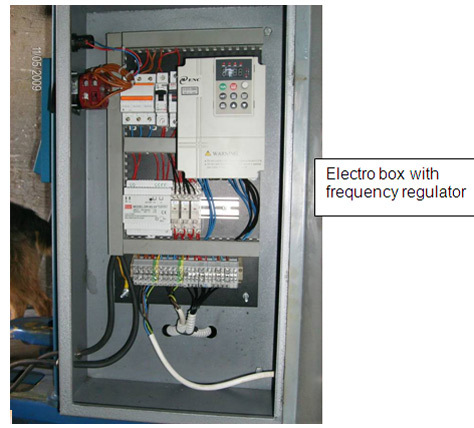 Smaller service activities include replacement of electro-switches and tasters. Contact the manufacturer for all more serious service activities.